Ten years ago, the Lovely Bride and I were at SeaTac, newly returned from a Thanksgiving vacation. 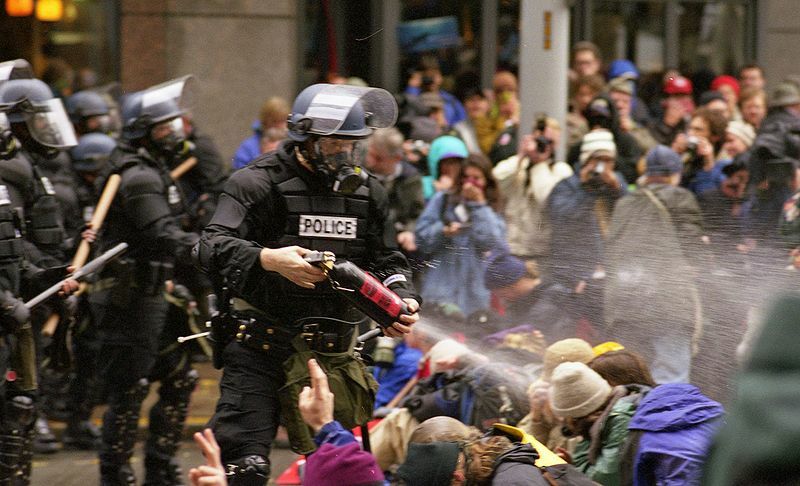 We had heard there were incidents at the World Trade Organization meeting in Seattle. The first day had gone big and gone well, but now things were getting dicey. Rumors of tear gas and dumpsters on fire. "Honey," I said, "Can I go downtown and fight the man?" "No dear," said the Lovely Bride, "We still have to get our luggage". Ten years ago there were massive peaceful protests and there were vandals. There were sympathetic officers and there was a police riot. There were friends tear-gassed in their homes and an armored "Peace-Keeper" rolling through Capitol Hill. And where did we learn in ten years? One one hand, more people keep saying how the protesters were right, and that more enviro and labor voices are being heard at the table. And on the other hand that such protests have become passe in the after-Eleven world where public dissent is condemned and villified. And on the third hand, how things haven't really changed at all. It is just that you don't see them unless you go looking. Opus, written by Michael Hollinger, directed by Braden Abraham, through 6 December, 2009, Seattle Repertory Theatre. This is an ideal Rep play. Small company (five actors) engaged is a brisk, well-written, well-directed performance. And most important of all for a theater that claims "Repertory" in its name, the actors are all local or have local experience. Most of them I've seen before, and am glad to see again. One-woman road shows and original New York cast performances are all well and good, but Seattle has excellent home-grown talent, and it is a pleasure to see it shown off here. The five actors are members of the famous Lazaro Quartet, and with five actors for four positions, right off the bat you have an idea of the dynamics at play. The group consists of high-strung Elliot (first violin), laid-back Alan (second violin), elder, grounded Carl (cello) and trippy, mystical, talented Dorian (viola), whose behavior causes him to be ousted from the group and replaced with spritely newcomer Grace. (And yes, the names all begin with the string names). Dorian has "crossed a line" and Grace is a hotswap replacement, unsure of her place in the group or the dynamics swimming under the surface, with a week to prepare for the group's performance at the White House. The play moves effortlessly through time and space, from the apex of the group to problematic recordings to the breakup and Grace's appearance and back again. Part of it is captured in a portrayed documentary (a string quartet with a rock-star level documentary on them - huzzah! ), and you get a great feeling of how it all worked when it all worked together. Now, like some rock bands (the Monkees come to mind), the actors do not play their own instruments, and if you're going to have the actors play their musical parts in dumb show (the bowing is good, the fingerings non-existent), you'd best have damned fine actors. And the actors are absolutely brilliant in this piece. Allen Fitzpatrick (previous at the Rep in Private Lives) is perfect as the fussy martinet of a first violin. Shawn Belyea has a surfer-dude rock tour attitude as Alan. Chelsey Rives was excellent last year in boom and even better here, both capturing the nervousness of newcomer Grace as well as the drive necessary for creativity and personal success. And Charles Leggett (Toby Blelch in Twelfe Night) is the solid, mature Carl, the cellist. And yeah, I identified strongly with the character, both as a former cellist and often as the supposed grown-up in the room. And Todd Jefferson Moore as the flighty, druggy, mystical Dorian was by turns wonderful and worrisome, enchanting and frustrating. I have to admit, most of the irritation I felt towards the actor because of his earlier performance in Thom Pain (based on nothing). Such irritation has been paid off by this performance (mind you, I believe the in Thom Pain the audience was supposed to loathe the performer, and Moore had succeeded all too well). He is a perfect Dorian. 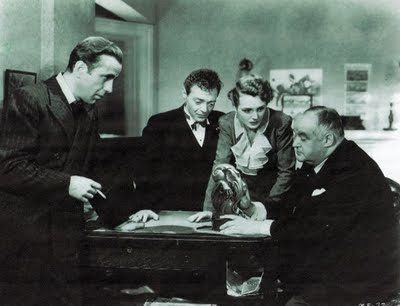 And the actors were supporting a snappy, well-written text that cut to the heart of creative cooperation. Perhaps that is another reason for my enjoyment - I've not only been in discussions like those among the quartet, but I have been in discussions EXACTLY like those of the members - a four-way marriage of age and experience and old slights and scabbed-over wounds. Yeah, it captures the nature of cooperation and compromise in a creative effort. 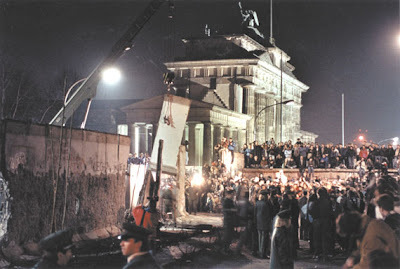 The setting itself is indeterminate, a pair of shifting walls that by turns become the various members' homes, backstage at the performances, and the backdrop of the documentary. Unobtrusive and well-mannered, it neither abandons nor overwhelms what happens before it. All in all, this is the Rep firing on all cylinders - smart, intelligent, engaging, and enthralling and native grown. An excellent play put together by a talented group. Go see it. Forty-Six Years ago, President Kennedy was shot in Dallas. I first encountered the above document, I think, in William Manchester's The Glory and the Dream, which was a history of the "swing generation", from 1932 to 1972. Excellent book, and it was the first time I read about the Bonus Army and the Wanna Go Home riots. In any event, Manchester was making the point that in the wake of Kennedy's assassination, there was a great national forgetting that anyone hated or even disliked the man in the first place. He offers the anecdote that more people claimed to have voted for Kennedy after his killing than actually voted in the 1960 election (though it was probably, to be more accurate, a higher percentage of the polled population claimed to have voted and voted for JFK). 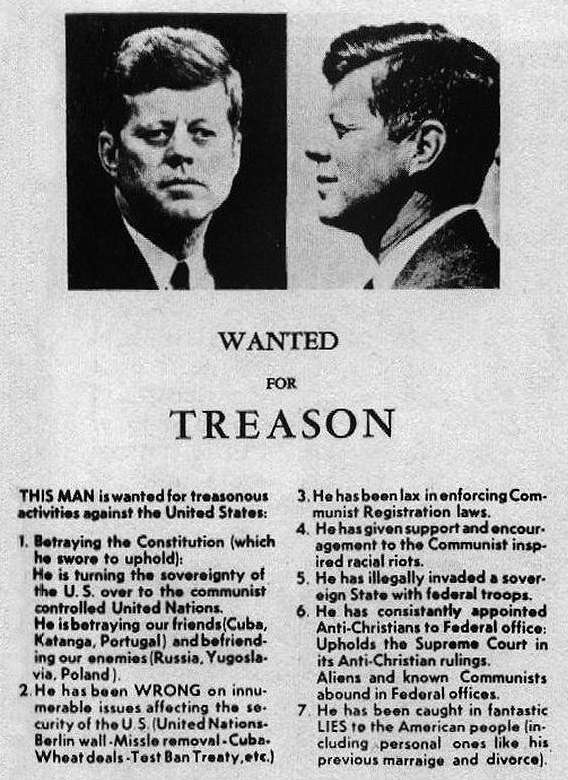 In any event, this document was offered up as being distributed on the streets of Dallas the week of the shooting (though not by Oswald - he was more of a "Fair Play for Cuba" kinda guy). But embiggen it and read the charges, and you may get a whiff of the modern age and how things have not changed. Also Item 1: Betraying our friends (Cuba, Katanga, and Portugal). By Cuba they mean the Batista regime in Cuba, which was booted out in 1959 by the Castro regime. JFK oversaw the Bay of Pigs debacle, in which US-supported exiles invaded the country, expecting the local population to rise up in support, which they failed to do. Katanga was a a breakaway province (1960) from the Democratic Republic of the Congo, which itself had just gained its independence from Belgium. Katangan independence had the support of Belgium business interests, but was opposed by member states of the UN (There it is again), and the province was forcibly reintegrated. Portugal I had to do some digging before I came up with Gao, a Portuguese colony on the west coast of India. In 1961 India captured Gao, and while the administration condemned the action, it did not reduce foreign aid to India. Yeah, its a little nuanced. Its also the last time anyone on the right really talked about Katanga OR Portugal. Also also Item 1 (OK, its not well organized - its a pamphlet): Befriending our enemies (Russia, Yugoslavia, Poland). Because if you're not actively hitting them, you're befriending them. No idea why Poland is on the list, other than that it was one of the more moderate (though still oppressive) communist governments of the time. And as for Yugoslavia, under strongman Tito its Marxism was more Groucho than Karl. Item 2: Being WRONG on numerous issues. Of course, being wrong is treason in itself (um, no its not). And the litany of incorrect issues reads as - if something occurred near JFK's watch, it is his personal responsibility, and is by its very nature wrong. We're looking at a laundry list of woes. Item 3: Lanessx in enforcing Communist Registration laws. Communistic Registration Laws, both local and federal, required communists to register with the government, for the good of public safety. Replace "Communist" with "Muslim" and you have a familiar level of hysteria. 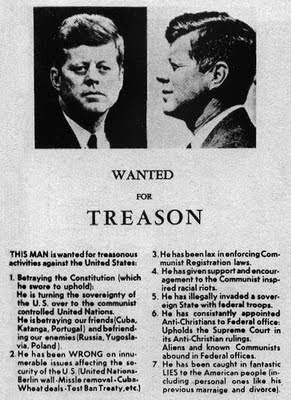 Of course, JFK may well have been lax, since Ike negated the laws with the Communist Control Act of 1954, which just outlawed the Communist party entirely (which, by the way, didn't really take, either). Item 4: Support and encouragement to Communist inspired racial riots. Another piece of right-wing gospel - the racial upheavals of the sixties were the result of foreign-sponsored agitators taking their orders from Moscow. Item 5: Illegally invaded a sovereign state with Federal Troops. Sounds serious? We're talking about enforcing desegregation in Mississippi and Alabama in 1963, while scrupulously ignoring Eisenhower doing the same thing earlier in Little Rock. Interesting how the bells of state sovereignty peel out whenever someone you don't like is in charge. Item 6: Consistently appointed Anti-Christians, upheld the Supreme Court in its Anti-Christian Rulings, and allows aliens (no, not that type - no, not that type either - by aliens read "foreigners" - no, not the band) and communists to abound in Federal Offices. Light on anything that sounds like a specific example, and also undercuts the initial assumption - if you SUPPORT the Supreme Court, how are you being treasonous (of course, the Supreme Court is treasonous as well, in this mindset). Item 7: Caught in fantastic LIES (not just lies, but Fantastic LIES), and gives the example of JFK's Secret Wife. Yes, this is the Birth Certificate uproar set in another time and place. The woman in question, Durie Malcolm Appleton, was supposedly married to JFK sometime in the late thirties or forties, and while annulled, never divorced in a civil court, making JFK a bigamist! Ahah! And even if he had been divorced (and Joe Kennedy had destroyed all documentation, the crafty old man), the US should never have a divorced man as its Commander-in-Chief (until, of course, Reagan, but that was completely different). Now, with all of the above, there is the frisson of recognition here. The strong rhetorical similarities between the birchers and the birthers, and the level of anger and raw hatred that bubbled up at the time for the first Catholic president of the US. And more importantly, a level of rage and indignation that seems awfully familiar to that of the past, and while the particulars change, the methodology remains. History does not necessarily repeat, as make Twain noted, it sometimes rhymes. I was going to repost "On Flanders Field", as is my wont, but I am feeling more hopeful with the process and discussions regarding the men and women who, at home and overseas, seek to protect us. So instead, I provide the link about Kobold Quarterly's Adopt-a-Soldier promotion. So where did we end up? Here's a round up, and a reminder that the ultimate goal is not to have your "side" win, but to provide good governance and decisions. I-1033, the latest Tim Eyeman magic pony initiative, went down in defeat hard. Lacking even the basic support of the usual suspects, it was hammered in the polls. This does not mean that there will not be ANOTHER similar Tim Eyeman initiative next time - he has figured out how to successfully monetize the initiative process, and as long as that exists, we will continue to see such foolishness. R-71 passed, allowing the state to say that "Yeah, we're cool" with domestic partnerships. A triumph for common sense, the Seattle Times is quick to warn that the measure did not carry on the far side of the Cascades (they even have a map to demonstrate it). Pity for the Times that it is people, not land, that votes, and the bulk of those people live on THIS side of the mountains (over 50% of the population in King and its adjacent Puget Sound counties). Dow Constantine has handily won King County Executive over Susan Hutchinson, and again, the Times, which endorsed Hutchinson and softpedalled here conservative cred, now is filled with morning-after declarations of how she should have been more direct with her political views while seeking a political post. Lost in the noise is the fact that non-partisan conservative Hutchinson did better than the last two official Republicans who ran for the office (and maybe further back - the official King County site is wimpy on archiving old election data). The charter amendments all passed. The candidates who ran unopposed all won handily. For assessor, Loyd Hara (previously from the Port) won over Bob Rosenberg. And for the Port of Seattle, we split the vote with Rob Holland winning, but Tom Albro beating Max Vekich. Downballot and local, Tim Clark took our local school district post,Allan Barrie took King County Fire Protection District No 37, Commissioner position No.1 and Alice Marchall is in at Soos Creek Water and Sewer District Commissioner Position No. 5. And Public Hospital District No 1 Position 4 went to Dr. Aaron Heide, which was my "toss-up" vote, so we'll see how we do with reforms at the hospital. And the Panther Lake area voted for Annexation to Kent. Not sure what happens next, and what changes it will bring. More on that as it evolves. There were a number of things I did not get to vote on. The big local one is the Mayor's race, which is still "Too Close To Call" (yep, its our winner this year for razor-thin decisions. So the next mayor will either be the pro-enviro with limited big city governance experience, or the business-type with limited big city governance experience. Both have strengths and weaknesses, though I am always suspect when someone states they're going to run a government "Like a business" (given how most businesses are run). Big blowout in things I did not get to vote on was City Attorney, where the long-term incumbent got crushed by the challenger. That one was a surprise as well. And nationally, the GOP took two governor's races (which is apparently REALLY BIG NEWS) while the Democrats expanded their House seats in an off-year election (which I understand rarely happens, but is apparently NOT really big news AT ALL). But locally, things worked out pretty well. Now the work, as they say, begins.